Malachi's unique position as the final book of the Old Testament offers a glimpse into the hearts of Israelite men and women, members of a nation that had been specially chosen by God, descendants of Abraham, and inheritors of the rich tradition of the Jewish people. Their history told of glories like the exodus from Egypt and the faithfulness of God to King David. But they had also experienced the judgment of wandering in the desert and the shame of exile from the Promised Land. The people of Judah began to be exiled from the Promised Land in 605 BC, returning from Babylon seventy years later. By the time of Malachi, they had been back in the land for more than a hundred years and were looking for the blessings they expected to receive when they returned. Though the temple had been rebuilt, the fervour of those early returning Israelites gave way to a thorough apathy for the things of God. This led to rampant corruption among the priesthood and a spiritual lethargy among the people. 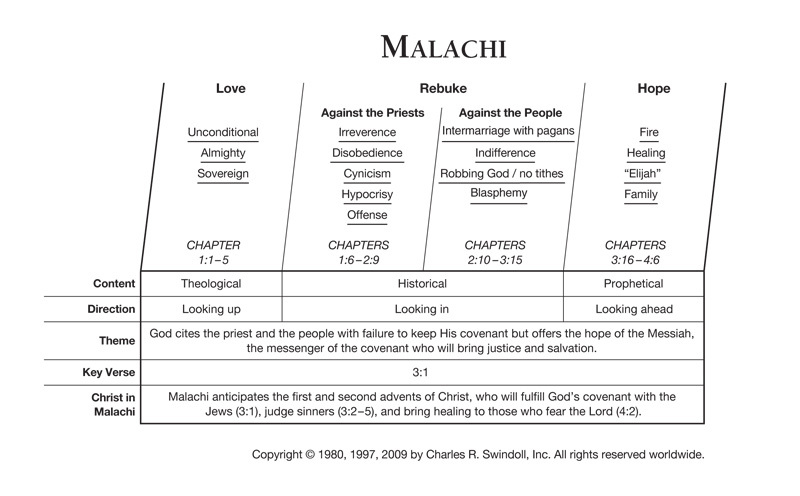 Find resources in the book of Malachi in our resource library.